This year’s 13 Days of Green is of special importance. 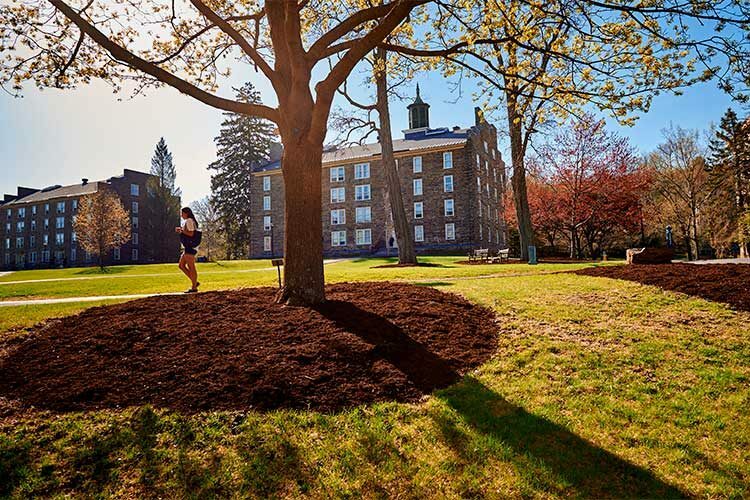 With Earth Day concluding the 13-day celebration, Colgate will then officially announce its achievement of carbon neutrality — the first university in New York State to do so. For Madison Smith ’19, sustainability intern and chair of the programming committee for 13 Days of Green, the series of events helps the community to recommit to sustainability in their everyday lives while broadening their understanding of environmentally friendly practices. The kickoff event was supported by the President’s Club, the Beekeeping Club, Common Thread, Students for Environmental Action, COVE, Career Services, the Office of Residential Life, the Community Garden, UCan, and the Office of Sustainability. During the next two weeks, participants can help usher in Earth Day by participating in additional 13 Days of Green activities. Programming includes various lectures, brown bag discussions, and dinners; 13 Days of Green Afternoon of Service; a film screening of Paris to Pittsburgh, and a campus-wide “no waste” barbeque. On Earth Day, as the University celebrates carbon neutrality, journalist Ann Curry will visit Colgate. At 6:30 p.m. on April 22 in the Memorial Chapel, Curry will discuss topics such as climate change, the future of journalism, and building a meaningful life. The fireside chat is open to the public and is sponsored by the Milmoe Workshop in Journalism and the Kerschner Family Series Global Leaders, and hosted by the Maroon-News.